Before you abandon it, read this: One of nature's most perfect foods may be even better for us than previously thought. 1. Egg is equal to cholesterol! Reality: Eggs are an excellent source of proteins, lipids, vitamins and minerals, and high in folate, which helps makes blood in the body. Researchers at the University of Alberta recently discovered they also contain antioxidant properties, which helps in the prevention of cardiovascular disease and cancer. They found the yolks contained two amino acids, tryptophan and tyrosine, which have high antioxidant properties. However, when the eggs are fried or boiled, antioxidant properties were reduced by about half and a little more than half if the eggs were cooked in a microwave. 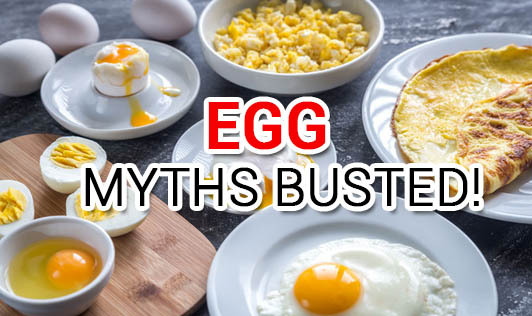 Reality: Egg proteins get converted by enzymes in the stomach and small intestines and produce peptides that act the same way as ACE inhibitors, prescriptions drugs that are used to lower high blood pressure. Peptides are formulated to help prevent and treat hypertension. Anything that helps lower your blood pressure cannot be heating, unless you're consuming too much, in which case even spinach is bad. Reality: At 90 calories, this humble, nutrition-packed handful is extremely useful for those who want to lose weight. A breakfast of one boiled egg and a whole-wheat toast increases basal metabolic rate due to the thermogenic -calorie burning-effects of egg, and stabilises blood sugar, leading to lowered hunger pangs and cravings. 4. If you're working out, eat chicken or whey protein, not egg! Reality: The egg yolk contains loads of fat soluble vitamins like A, D, E, K, and carotenoids. These fat soluble vitamins do more things than you could imagine; boost your immune system, reduce your risk of cancer, keep your bones, teeth and skin healthy, support the thyroid gland, reduce the damaging effects of diabetes, and promote healthy growth in children to list a few. The egg yolk contains 99% of zinc, 90% of calcium and 95% of folate. Astonishing! (Zinc is a crucial mineral for sperm count). Finally get this: egg whites are touted as the protein part of the egg, which is true. However, the yolk contains 43% of the total egg protein and balances the amino acid profile of the whole food. Reality: Running early in the morning on raw eggs can make you seriously ill. Contaminated eggs kill up to 5,000 individuals each year in the US. One egg in 10,000 is infected with salmonella. Don't eat undercooked eggs, or make savage attempts to make eggnog on your own, and please don't swallow them raw-even if you are Rocky Balboa.